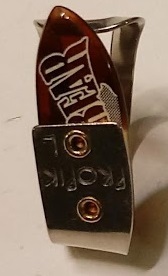 Red Bear Trading's Original Thumb Picks were designed in 2005 with the help of Doug Jones aka "Little Brother" who helped design the shape of the blade. The bands are made utilizing Guptill Music's Propik. The blade is made from the same material as our "Original" Flat Picks in our Heavy Gauge at 1.5 mm thick and measures 14.6 mm from the edge of the band to the tip of the blade. A Pick Maintenance Kit is included with your Thumb Pick Order. To adjust the fit of the Thumb Pick band DO NOT use the blade for leverage. Grasp the band itself and form it to your thumb. Please allow 2 to 3 business days to make and ship your Thumb Pick. Choose the color for your thumb pick blade. Red Bear thumb pick is the best available. Period. 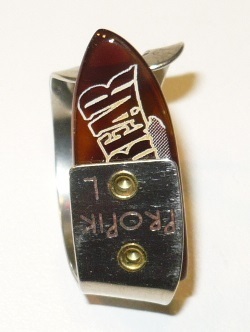 I ordered my Red Bear LB Custom thumb pick in 2009. I was immediately impressed by the incredible quality of the pick, but it was the tone that really knocked me out. The attack is powerful, completely noise free, and smooth as silk. I don't know what Dave does to shape his picks, but I haven't played one like it since. I had played around with a couple dozen other designs, but was never quite happy. The attack was either lacking something, there was noise, or the pick just wasn't comfortable. The metal band makes the pick totally customizable to your thumb such that you never have to worry about fit or comfort again. But did I mention the tone? I'm pretty sure I did, but I will say again you will not find a crisper, more powerful, or more natural pick. It truly glides off the string. I have had many players come up and ask me how I get such power and depth to my sound and I proudly show them my Red Bear. If you still aren't convinced, here is the kicker - I've had the same pick for the last 9 YEARS. The wear on the pick is practically zero. At one time I ordered a replacement as a backup and took a photo of the two picks right next to each other. The 9 year old pick, which has hundreds of playing hours, has not worn one bit. Finally, Dave is great to work with. His pick has become a treasured and integral part of my sound. If I could give him 6 stars I would. It's that good. In fact, I buy them for my close guitar friends. I love this pick and now use it for most of my playing. I just ordered a few others for backup and variety.